In the lightly-populated northwestern corner of Nevada, a former geologist and rural schoolteacher, a published poet and ranch owner, and an artist and environmentalist make for an intriguing—perhaps even unlikely—trio of friends. In this evocative collection of personal essays, each offers her voice as a testament to the joys and struggles of creating a home and connecting to the land and the people who live there. Stories of ranch hands and Ladies’ Clubs, raising chickens and raising children, pulling up roots and planting dreams tumble together in a mélange of lives lived well and thoughtfully. Sharing Fencelines is as much about art as it is about activism, as much about personal growth as it is about growing community. What these women offer us is the sweet taste of what is possible, and the blended harmony of their voices echoes across the mountains and washes and deserts, resonating in our own hearts, our own homes. Carolyn Dufurrena’s "The Flying Heart Museum" pays homage to a layered landscape of unique individuals—not the least of which are her students, searching for themselves in the Nevada wilderness: "You know how your spirit betrays you when you’re not thinking to protect yourself. Jose has been dreaming, doodling away, and his pencil has discovered this flying heart, as big as the Puritan meetinghouse....He has drawn the log cabin around the heart, and labeled it. At recess I ask him, gently, 'So, Jose, what’s in there, in your Flying Heart Museum?'" 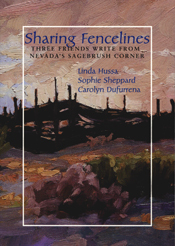 In "Shared Fencelines," Linda Hussa reveals the mystery of horses, the gift of water, and the serendipity of love: "My first hurt came from a horse when I tried to shinny up the feathered leg of our old gelding as I’d seen my brother and sister do. Twelve hundred pounds of him stepped on my bare foot. Mom carried her shrieking two-year-old to the house...she cut off the dangling nail saying Popeye didn’t mean to, he just didn’t notice my little foot. Then she cradled my face in her cool hands and said she hoped I would forgive him and we could be friends again." "Fire Hall" by Sophie Sheppard paints a picture of a families and communities forged against the backdrop of a rugged, rural life: "Here, when there is a funeral, the whole town comes. First to arrive are the older women, vestiges of the Lake City Ladies Club that was disbanded a few years ago because most of the younger women have jobs and no longer stay at home. At the potluck funeral dinner everyone will file in together: the women unfamiliar in dresses ordered from catalogs, the mens' hatless foreheads glowing pale in contrast to the tan of their freshly shaven jaws, the younger people that I won’t recognize." Linda Hussa has published both nonfiction—Sweet Iron and Diary of a Cow Camp Cook—and poetry—Where the Wind Lives and Under the Silence. She lives on a ranch with her husband near Cedarville, California. Sophie Sheppard’s paintings have been widely exhibited in the West from San Francisco to Montana. A dedicated environmental activist, she lives with her husband in Lake City, California. Carolyn Dufurrena publishes freelance articles, teaches grade school, and works with her husband and son on the Quinn River Ranch in Nevada.